music of expression - remote MIDI control through your iPhone! 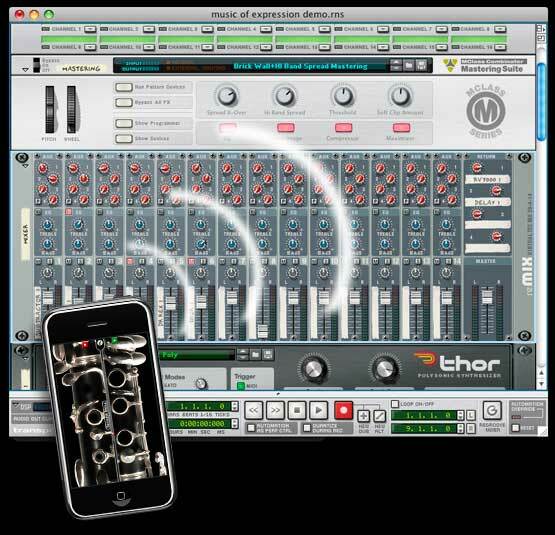 Control MIDI expressively through your iPhone. music of expression instruments include a third sound mode, aside from samples and the visual synth. MIDI control. Our instruments can wirelessly connect to your computer via our musicofx MIDI tool. Works great with Windows and OS X. Boot up Garage Band, Reason, SONAR, or Logic, and you're ready to start controlling your studio in a new, expressive way. You can also use it simply to record performances in MIDI -- wind instrumentalists might not be so comfortable on a MIDI keyboard, and after all, a MIDI keyboard doesn't have any breath sensitivity! Indeed, music of expression instruments can add a whole new dimension to your music production. Try it out today! Current music of expression users can get the midi tool here.